Notice: Airline-Approved Kennel — No pet transport kennels are pre-approved by the airlines, the airline associations, or USDA even if product labels make such claims. Please ensure that you purchase the strongest and most secure kennel you can find. Select dog breeds require transport in a reinforced crate. One of the most important steps you can take to ease the stress of travel for your pet is to make sure it becomes familiar with its kennel. Purchase the travel kennel as far in advance as possible. Veterinarians recommend leaving the kennel door open in the house with treats or a familiar object inside so that your pet may spend time near the pet crate and perhaps venture inside on its own. Since it is important that your pet be as relaxed as possible during the flight, familiarization with the kennel is essential. This kennel is the wrong size for your dog. This kennel is the correct size for your dog. Each travel kennel should contain no more than one adult dog or cat, or no more than two puppies or kittens younger than six months, of comparable size, and under 20 pounds (9 kg) each. Dogs and cats cannot travel together in the same container. The kennel must be constructed of rigid plastic, wood or metal. The roof must be solid with no doors or ventilation openings. The kennel must have ventilation on three sides for travel within the 50 United States and Puerto Rico. 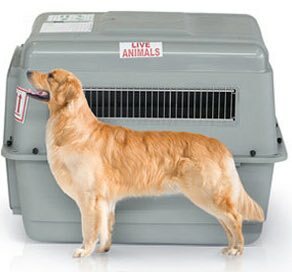 The kennel must have ventilation on four sides for travel to and from all other destinations and for short-nosed dogs traveling to any destination. The kennel must be large enough for your pet to freely sit and stand with its head erect, turn around and lie down in a normal position. Your pet’s head or ear tips, whichever is higher, must not touch the top of the crate. 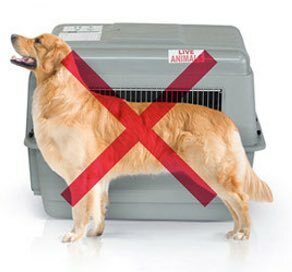 If your pet’s kennel does not provide enough room for your pet to stand and sit, without the head touching the top of the container, you will need to purchase a larger kennel before your pet can fly. Approved kennels may be available for sale at many pet supply stores. Airlines require an additional 3 inches of height clearance when transporting your pet to and from any destination outside the U.S. and Puerto Rico. Short-nosed dogs require a kennel one size larger. The kennel door must be made of metal. Plastic and Fiberglass™ doors, including side plastic latches, are prohibited because they are not strong enough to protect animals during normal handling. All kennel hardware must be secure and in good working condition. A metal nut and bolt must be secured in each hole that is in place to connect the top and bottom of the kennel. Please note that it’s common for kennels to have nuts and bolts that are metal and covered with a plastic coating on the outside, and those are acceptable. Snap-sided kennels or kennels with plastic side latches will not be accepted, unless the shipper drills holes and adds metal nuts and bolts to secure the snap or latch closures. Two dishes (one for food and one for water) must be attached to the inside of the kennel but also be accessible from the outside of the kennel so they can be filled from outside the kennel without opening the door. The door must close securely. In accordance with federal regulations, animals must be accessible in the event of an emergency. Regulations require that any wheels must be locked or otherwise rendered inoperable. Kennel wheels must be either removed or taped to prevent the kennel from rolling in transit. The floor must be solid and leak proof and contain absorbent material, such as shredded black-and-white printed newspaper.